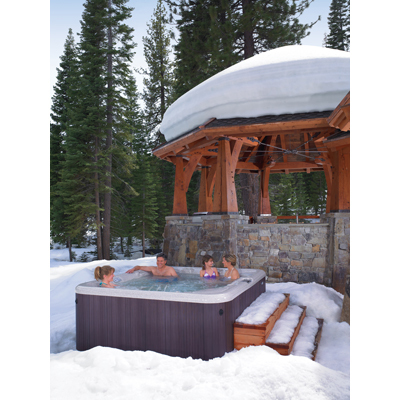 Hot tub soaking outside in the winter is not only the best time because of the contrast between the heat and the cold outside, but it may make an important difference in your mental health. When you’re indoors all day in winter, your outdoor time is usually limited to the dash from your car to your office or grocery store. Take time for a Hot Spring Spa break outdoors in the hot tub. The mental health benefits may surprise you. A recent survey of our Olympic Hot Tub Company Hot Spring Spa owners echoed Dr. Pretty’s research most strongly in regards to his second point of engagement with nature. All of the Hot Spring Spa owners surveyed reported immense pleasure, increased mental relaxation and peace of mind from soaking in their hot tubs outside. They all said that being in the presence of nature was the “frosting on the cake”, the “cherry on the sundae” that capped the experience and took it from the mundane to the sublime. It was the reason they rarely missed a night’s soaking. It was the reason why their own yards gained a bigger place in their lives. Outside soaking opened up a new appreciation of the previously unseen natural world. People mentioned owls, squirrels, raccoons, the wind, stars, the trees and far vistas. So in addition to the great physiological benefits, the mental/spiritual benefits were the most deeply moving. RES EST SEVERA VOLUPTAS-Latin for Pleasure is serious business.